All mustard BBQ sauces are not made equal. Though each sauce starts with a common base, color, texture, sweetness and spice can vary by extreme degrees. Pork Barrel's Mustard BBQ Sauce elevates it's familiar base ingredient with sweet and tangy accents creating a truly uncommon sauce / condiment. Pork Barrel Mustard BBQ Sauce is packaged in 12 oz. glass bottles and wrapped in Pork Barrel's stylish label. The sauce is light brown and speckled with dark spices. The texture is on the thicker side, but it's still slightly thinner than a typical yellow mustard and pours smoothly. Pork Barrel's Mustard BBQ Sauce is sweet and complex. Honey, ketchup, vinegar, Worcestershire sauce give the mustard a nice balance of sweet and tangy. Additional flavor depth comes from savory ingredients like ginger, tamarind and garlic. There's even a slight note of heat thanks to the addition of cayenne pepper. This complex blend of flavors make Pork Barrel's mustard more than just a burger / hotdog condiment. It's truly a full bodied BBQ sauce. I first used Pork Barrel's Mustard BBQ sauce on smoked chicken quarters. I also served extra sauce as a dip for the smoked poultry. I felt the sauce worked equally well both ways, though the flavor was altered quite a bit when cooked on the chicken. For a mellow, sweet finish, heat the sauce. If you're looking for a tangy mustard bite, serve the sauce cold as a dip. Though the sauce works well for BBQ, the mustard base also makes it a valuable condiment. I've used Pork Barrel Mustard BBQ Sauce on burgers (in place of yellow mustard). I also put a couple shots of it in my chicken salad. In my opinion, Pork Barrel does just about everything right with their Mustard BBQ Sauce (and that's coming from a guy who's not a huge fan of mustard). The sauce doesn't just have one note tang. With plenty of sweet and savory accents, Pork Barrel's mustard has a little something for everyone. To order your own Pork Barrel products, click here to check out their website. 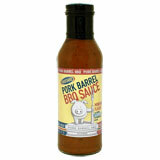 You can also see how Pork Barrel's Mustard BBQ Sauce rates on our "Product Reviews" page. 2 Response to "Pork Barrel Mustard BBQ Sauce"
Another great use for Pork Barrel Mustard BBQ Sauce is to use it to replace yellow mustard in potato salad. You will find this to be a very pleasant experience.